WHAT: Brides can search for and book wedding venues, photographers and catering services guaranteed to be available on their date and within their budget. 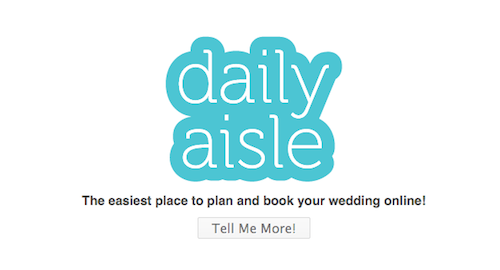 Daily Aisle [ @dailyaisle ] is essentially Expedia for weddings. LAUNCHERS: Jeff Lu, CEO [@jiffylu, LinkedIn ]. Kim Dowd, lead designer [@kimsheblue, LinkedIn ]. Conan Jen, chief engineer. Dana Wu, business development [ LinkedIn ]. INSPIRATION: Jeff and Conan "were groomsmen in a few weddings last year and saw, first hand, how difficult it was to plan a wedding," Jeff told LAUNCH via email. "The current solutions online were horrible user experiences. They were optimized for pageviews and not for helping people find the right vendors for them." Also, it's a big market: 2.1M weddings a year at an average cost of $19K or about $40B. BUSINESS MODEL: Daily Aisle takes a percentage from each booking. COMPETITION: TheKnot, WeddingChannel.com, MyWedding, Brides.com. INVESTORS: Dave McClure / 500 Startups, Lightspeed Venture Partners (Summer Grant).